Today’s article comes from a pastor, author, and inclusiveness/disability advocate in the Susquehanna Conference, who writes out of her very personal experience at the intersection of gender, ethnicity, and ability. Straight white men like me don’t viscerally understand the challenges and the gains made in The United Methodist Church at that intersection, so I’m incredibly thankful to Rev. Rebecca Holland (blog: BeckieWrites.com) for her contribution today. If you’d like to respond or offer your own submission, here are the guest posting guidelines. A progressive split in the United Methodist Church threatens the very diversity it claims to want to protect. After the events of the 2019 General Conference, many people have called for LGBTQ+ Methodists and their allies to split with the established United Methodist Church in order to form a new and more “progressive,” denomination; however, in the midst of strong feelings, few people have stopped to consider the complex and unforeseen repercussions that a schism would cause. Even with my poor eyesight, I can clearly see that if the United Methodist Church splits, the gains that have been made for women, people of color, and people with disabilities will be lost. A schism threatens the very diversity that it claims to want to protect. It is my prayer that, instead of shattering the United Methodist Church to pieces, you will stay and fight with me—not just for members of the LGBTQ community, but for all underrepresented groups. The appointment system in the United Methodist Church means that all elders, no matter what their skin color, gender, or ability level, are guaranteed an appointment. In return, we covenant with the church to itinerate as needed. This has come to be called the guaranteed appointment system. Many people have complained about the itineracy system and the 2012 General Conference even attempted to remove language that guaranteed appointments for ordained clergy; however, the guaranteed appointment system was upheld by a ruling of the Judicial Council. The guaranteed appointment system is like an arranged marriage between a pastor and a church. A congregation must accept the pastor who has been appointed to them by the bishop. This means that the bishop is empowered to make cross-racial and cross-cultural appointments. The guaranteed appointment system fosters multicultural and cross-racial interaction. I serve in what is considered to be a cross-racial appointment (I’m half white and half Filipino and my congregation is predominantly white) and I can honestly say that the experience has enriched the spiritual growth of both myself and my congregation. The appointment system in the United Methodist Church protects diversity. It means that, in the future, if I was assigned to a church that didn’t want a female minister, the appointment would still remain. We all serve at the pleasure of the bishop. The guaranteed appointment system protects ordained clergy who are women, people of color, and/or people with disabilities. If a schism were to occur, our delicate system of itineracy could be shattered. Some suggested plans for a Way Forward included a clause where congregations could chose whether or not they would accept an LGBTQ pastor. If congregations are able to begin refusing clergy, this becomes a dangerous situation for people like myself who are often viewed as “hard to place” pastors. According to the U.S. Bureau of Labor and Statistics, 80% of people with disabilities are unemployed. A significant reason for this is not because we are uneducated or unable to work. Instead, the reason these statistics are so abysmal is because of the systemic nature of the sin of ableism. While I appreciate the compliment, I am also reminded that the underlying assumption in this statement is that a person with sight loss or another disability would be less effective in ministry. Such statements are a reminder that some congregations who would readily accept an able-bodied LGBTQ pastor, or even an LGBTQ pastor of color, would balk at accepting a pastor with a disability. The Book of Discipline ¶ 639.7 calls for conferences to “sponsor or participate in a group healthcare plan,” for the benefit of “full-time clergy,” and states that “the annual conference may require its local churches,” to adopt this plan. This opportunity for health insurance is of vital importance to many members of the disability community. Health insurance covers doctor’s visits, occupational therapy, and vital medications. Without access to health insurance, I would lose my eyesight. There is no way I could afford my medication without health insurance. My membership in the body of Christ as an ordained elder in the United Methodist Church not only nourishes my spirit and fulfills the calling God has placed on my soul, it also preserves my diminished sight. Would a new Progressive Methodist (or Conservative Methodist) church offer health insurance to its clergy members? For many young people from underrepresented groups, access to higher education can feel like an insurmountable mountain to climb. Although God had called me to the ministry during my sophomore year of college, I knew that a seminary degree was beyond my grasp. It was financially impossible. Then, I received a matching grant from my seminary and my conference in order to cover the cost of tuition. I also received a working loan from the Susquehanna Conference in order to purchase my adaptive software and accessibility technology. I would not have been able to attend seminary without this financial assistance, as well as later grants from The Preacher’s Aid Society. If the United Methodist Church splits, funding for our seminaries is put into jeopardy. Currently, the Ministerial Education Fund helps to support thirteen United Methodist Seminaries. If the Ministerial Education Fund is lost due to complications resulting from a schism, seminaries would be hard pressed to make up for the loss of funding. This means that there would be less scholarship opportunities and fewer grants available to students in need of financial assistance. We need more diverse seminarians. Instead of shattering the United Methodist Church into pieces, let’s work together to make certain that young people from all walks of life who have displayed gifts and graces for ministry have access to a seminary education, if they desire to pursue one. The United Methodist Church has over 12 million members in 136 different countries. The beauty of our church, and what makes us distinct from other protestant denominations, is our connectional nature. One example of our global impact as a connectional church is the United Methodist Committee on Relief (UMCOR). When my parishioners come to me and ask how they can help the wildfires in California or victims of flooding, I encourage them to give their money directly to UMCOR. UMCOR is usually the first on the scene and the least to leave. Often, UMCOR arrives even before the American Red Cross. One hundred percent of money donated to UMCOR goes to disaster relief. UMCOR allows me to help with disaster relief throughout the world, even when I cannot physically be there myself. Furthermore, as a global church, we have helped to reduce the global impact of malaria by fifty percent. “In 2007, the World Health Organization estimated there were more than 1,000,000 malaria related fatalities. In 2015, the number was reduced to 438,000. While that is still a staggering number, an over 50% increase in life is worth celebrating (UMC.org).” Such extraordinary progress would not have been possible without the global and connectional nature of the United Methodist Church. In the future, would we decide not to send missionaries or aid to countries in need because we disagree with their stance on LGBTQ issues? I disagree with the treatment of people with disabilities and women in many countries, but that does not mean that I believe those countries should not receive aid. Already, conferences and church leaders are talking about withholding funds from apportionments as a bargaining tactic. This is a threat to both our global missions and marginalized groups right here in the United States. When we withhold our giving and our apportionments, underrepresented groups suffer. One concrete example is the fact that our apportionments support the Black College Fund. The Black College Fund is a way to empower future leaders from the black community. We need more diverse voices within the church, but a schism would cause an unfathomable number of cutbacks across the denomination as well as individual conferences. Deacons, Licensed Local Pastors, Certified Lay Ministers, and Lay Servants? Few people have stopped to consider the unforeseen repercussions a split might have on other important voices in the church: Deacons, Licensed Local Pastors, Certified Lay Ministers, and Lay Servants. The order of deacons is a special group of people called to word, order, compassion, and justice (Book of Discipline, ¶329). Deacons have a very unique call to connect the church, “with the most marginalized among the children or God (Book of Discipline, ¶ 328).” Deacons are invaluable when it comes to protecting and advocating for the needs of the marginalized. Would a new Progressive Methodist (or Conservative Methodist) church have a place for deacons? During my time in ministry, I have seen how important Licensed Local Pastors, Certified Lay Ministers, and Lay Servants are to the life of the rural church. Through our connectional system, small churches that are unable to support an ordained elder are still provided with a pastor to shepherd them. Furthermore, many small churches in rural areas are supported, at least in part, by conference funds. The United Methodist Church is wide enough to support a variety of different clergy with many different gifts and graces. Not everyone is called to a life of itineracy, like ordained elders. A schism could cost us many of our clergy colleagues as well as many of our small local churches. The beauty of being a global church means that when a person puts money in the offering plate at my church in Altoona, that gift can spread as far as West Africa or Mongolia. Part of being a global church also means that as people here in the United States, we do not always get to choose how things are operated. This can be a difficult lesson for many of us because the United States is an individualistic culture that likes to be in control. It behooves us to remember that God is the one who is in control. There are ways that people live out their faith in other countries, or even here in my own country, with which I do not agree; conversely, I am certain that there are ways that I live out my own faith that others both here and abroad would find problematic (For example, there are still many Christians who disagree with the ordination of women). However, this does not mean that I do not want to be the church with those other countries. I can vehemently disagree with someone and still recognize that they are an important part of the body of Christ. I have found a home in my small church in the Susquehanna Conference. I will never abandon my home. In the future, if the church splits, there may come a time when protections for women, people of color, and disabled clergy are lost along with the guaranteed appointment system. But even if that comes to pass, I will not voluntarily leave. The United Methodist Church has already lost a substantial number of diverse voices. A split would only take more diverse voices and leave us missing a very important piece. 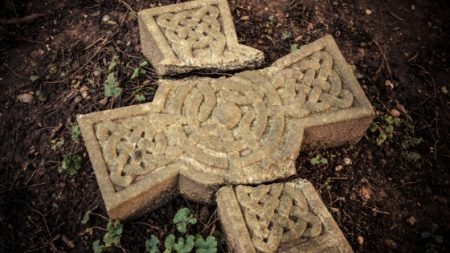 If both conservatives and progressives leave the United Methodist Church, we will be left with nothing but the broken pieces in the middle. Previously, I had written a piece in UM Insight that used the metaphor of divorce when referring to the possibility of a schism, but in the end, whatever metaphor we choose, the fact remains that as ordained clergy in the United Methodist Church, the vows we made at ordination are a holy and sacred covenant. During ordination, when the bishop and those gathered lay hands on those who have been presented for ordination, something truly sacred occurs. Although laity, Licensed Local Pastors, Certified Lay Ministers, and Lay Servants are not ordained in the same way as elders, we are all united by our common baptismal vows. We are all important and sacred pieces of the body of Christ. I hold a deep reverence for the vows I made at my ordination; therefore, I will uphold and followThe Book of Discipline,even if I disagree with parts of it. I disagree with parts of the Holy Bible, such as the prohibitions against women clergy (1 Corinthians 14.34 & 1 Timothy 2.11-12) but I will continue to do my best to live a life shaped by Holy Scripture and God’s grace. I am a work in progress, striving ever onward toward perfection, and so is the United Methodist Church. We need all voices, including conservatives, progressives, centrists, and everyone in between, to make the body of Christ. We stand to lose too much if we do not stand together. This article is a follow up and expansion to the piece, “Do Not Split the UMC: Stay and Fight with Me,” which can be found on Rev: Rebecca Writes: Read, Write, Pray. Rev. Rebecca L. Holland (B.S. English Ed. & M.Div.) is an ordained elder serving fulltime in the Susquehanna Conference. She is the chair of the Disability Ministries Task Force of the Susquehanna Conference and she has been recognized by Path 1 Discipleship Ministries as an emerging young leader. Her articles related to inclusiveness, disability, and the church have been published by UM Insight, Bold Blind Beauty, and CAPTIVATING,among others. Her chapbook, Through My Good Eye: A Memoir in Verse is available from Amazon. All profits benefit the ministries ofChrist Community UMC, Altoona. She is a member of the Order of St. Luke. Rebecca writes about faith, books, and disability awareness on her blog at BeckieWrites.com. These issues are why we should make the split happen in a conscious, intentional way rather than smaller groups splitting off here and there. The splitting is happening the question before us is how to do it well. Thanks for your thoughts. They’ve given me some things to consider. However, I have to agree with Sarah who says the splitting is happening, and your comments are reason why we should do it well, not avoid it altogether. We HAVE been working and fighting within the system to change it for decades, and the prohibitions against full inclusion have only gotten more harsh. The only hope I see is through some sort of schism, but one that is done as a conscious uncoupling. I greatly appreciate the point of view here. There’s no guarantee that the itinerancy item will be held going forward – considering that the Traditionalist view has expressed a lot of issues with the Bishops and their influence, I’d expect that this item is probably in consideration for being on the chopping block in the next 1-2 General Conferences. The concern with this being retained is also partially a matter of volume – what’s the census count on elders, and full time appointment positions; where do those lie along the conservative and progressive lines? Example: if there were 200 elders and only 100 positions for them, can you really guarantee a position for all (generally I believe the ratio is more positions than pastors overall, but a split might change the ratio on one side). But I’d expect that a split would still offer health insurance for elders (in addition to some version of pension continuance). Deacons, LLPs, etc seem to me to be pretty safe – a split might well define who would want these roles in either branch (I imagine that if you had a conservative/progressive split, the people who would choose to be deacons on either side might be VERY different kinds of people). The big set pieces – the college funds, the seminaries, UMCOR, etc – those are the ones most in danger, as a split could dramatically affect the funding. Whether we split or remain united, there are a number of churches that are going to fall in the coming years. Already some progressive folks are ‘voting with their feet’, and even some conservatives are doing so if they see that there’s opposition in their church to the conservative view (either among the congregation or even from the pastor). Sometimes they have to, and the best we can do is pick up the pieces. It might be better if we can act proactively to preserve what we can. Thank you for a very thoughtful perspective. So much to ponder. It would seem that with the majority of U.S. members supporting inclusivity, there needs to be a way for a modification of the discipline to recognize that—much in the same way the discipline has been modified for other countries. Have the promoters of the restrictive plan alerted the Third World Countries of the likelihood of a major reduction in financial support? What will happen to the UMW and the UMM? The Rev. Rebecca Holland speaks for me. We must learn to work with those with whom we disagree. We agree on much more than we disagree. The median age of our membership is 57. The demographics aren’t going to change on this in the foreseeable future. We tried, and failed. Now it’s time to try anew. While I understand that many may see the value in remaining and fighting, we should all at least minimally acknowledge that LGBT people are in a very different boat than straight progressives. We are the current targets of institutional violence. We are asked to endure facial, de jure discrimination other identity groups would never be expected to accept. Many of us have been fighting for decades just to scratch out any place we can exist in the UMC, and have had to do massive work just to get straight progressives to where they are now. If others wish to stay and fight that’s there call, but let’s at least be reasonable enough to understand that LGBTQ people may need to leave for their spiritual and emotional health. We really shouldn’t expect them to take on a fight in which they will bear infinitely more damage than their straight counterparts unless there is an actual realistic plan for winning that fight. Even if there is no split, there is the numerical decline that is already expected to make the connection untenable over the next decades because people have. Also, GC2020 is going to be presented the largest budget cut in recent history. So which is better, an organized parting of the ways or a slow and dwindling death? What Rebecca missed are two major realities that would ensue after a split. The first, and most significant (IMO) is the disappearance of the United Methodist Church (and its predecessors), to which all ordained Elders/members in full connection made their vows of loyalty. What ‘disloyalty’ on the part of an Elder would look like is clear and obvious (or so we think). But what about the faithfulness of the United Methodist Church itself as a corporate body to continue to be the manifestation of the Body of Christ with which all ordinands vow to be in a relationship of faithfulness and integrity? And what about the faithfulness of ALL ordinands to continue to uphold the integrity of the UMC by their actions, rather than to do their best to undermine or dissolve its bonds? I’m naming you guys: the Reverends Lambrecht, Dunnam, Renfroe, Billy J. Abraham, and Boyette, among others, plus Bishops Scott Jones, Michael Lowry, Mark Webb, and Gary E. Mueller among others. Until now no ordinand has ever imagined that he or she promised to be loyal to the Church of Humpty Dumpty. So what happens after the Church with which we took mutual vows of loyalty disintegrates into fragments and no longer exists as that body with which we vowed to be in covenant? What happens to episcopal authority, including the final authority of appointment and the ‘guarantee’ of appointment? What happens to an Annual Conference when a formerly-UMC local church group of renegades can ‘steal’ real estate owned by the Annual Conference to conduct and supervise United Methodist ministry in that place? The second major reality that would ensue from the implosion of the United Methodist Church into fragments is a devastating dissolution of the group of those called and in training to enter professional ministry. Those willing to jump into ministry within a Traditionalist Methodist denomination would be a small group of True Believers untouched by any greater vision of ministry within a larger theological/ecclesial framework. That pool of potential ordinands would spell doom to the Traditionalists over a longer time frame than the life span of any who are currently trying to destroy the United Methodist Church. In other words, those guys (some of whom I mentioned above) have planted a time bomb that will undo the ‘pure’ church they want to leave behind when they die. As well as (more obviously) undoing the integrity of the current United Methodist Church they vowed to uphold. And then there’s the reality of dissuading United Methodist seminarians from affiliating with any of the post-implosion ‘expressions of Methodism.’ Many will choose to plant their gifts for ministry in more fertile fields elsewhere and find more sustenance for their spiritual growth among those who fight less and love more–and are more generous to ALL who are drawn to their work (LGBTQ included). And now I just can’t wait to hear from the Usual Suspects on this site! The current state of our beloved UMC can not go forward with both sides claiming they are correct. I laugh at the doomsday predictions for the “Traditionalists” that only want to uphold what has been in God’s Word from the beginning and similarly in our Book of Discipline. If an ordained elder can not faithfully uphold these teachings and requirements then why not go to a more accepting denomination? Is job security more important than following your true beliefs? We all are the problem and Jesus is the only true solution. In all I read, I still see no one on the “progressive” side calling homosexuality a sin. That is all I really wish to see. Name sin, sin. If we can’t agree on what is sin and what is not sin. How can we go forward? If we don’t call out sinful behavior as sin, how are we to call people to repentance? And as an evangelical leaning pastor that champions a “traditional” view I take great exception that “we” are not able to have a great vision of ministry within a larger framework. I love and promote God’s Grace, Mercy, and Love for all from my pulpit. Some how this small group untouched by any greater vision of ministry was able to pass the Traditional Plan. I don’t believe that homosexuality is a sin. In your view that would make me a bad Christian, I suppose. I’m okay with that, to be honest. I agree that if we can’t agree on what is an is not sin, we’ve got an impasse. Care to put a list together? Anger pride and hostility are the truest of sins and dropping a Mic and picking up the Mic are examples of those sins. Why must we try to inflict our opinions and morality on others? Rev. Jeremy Smith, When differences are irreconcilable. ( biblical authority sexuality etc.) Staying together make the pain last much longer. What do you say to a queer young Methodist person in high school. Who have witnessed the hatred and actions of United Methodist adults. In regards to their sexuality for fifty years?Knowing also that the highest number of young people committing suicide is by queer youth.Jeremy your intention may not be abusive. But your outcome is.